Bestar Innova U-shaped workstation in Tuscany Brown & Black - Innova conjugates working and living with style. 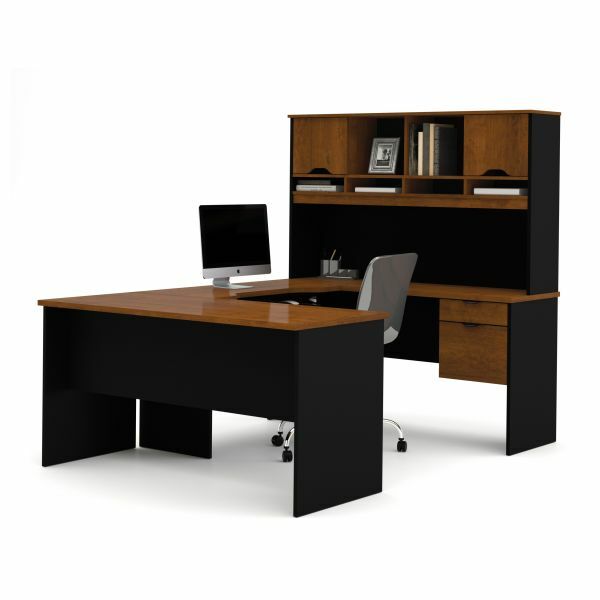 It offers various storage possibilities for an organized work environment. Durable 1 in. commercial grade work surfaces with melamine finish that resist scratches, stains and wear. The workstation offers one utility drawer and one file drawer with letter/legal filing system. The File Drawer and the keyboard shelf are on ball-bearing slides for a smooth and quiet operation. One lock secures both drawers. The hutch offers paper shelves, close and open storage and a rubber strip for wire management to keep your work surface organized. The station is fully reversible. Finished back.